The other day I wrote about the lack of cupcakes and chocolate crackles in my house whilst growing up. We did not, however, lack in sweets. We always had a daily supply of some sort of pastry in the house. My mother didn’t believe in buying biscuits or cakes (never a tim tam to be seen!) but she absolutely did not fail in the baking department. One regular was this shortbread-y jam roll that looks like a mini croissant. We call it a “kiflice”. A standard Balkan delight. Preheat oven to 180 degrees Celsius (fan forced). Line a baking tray with baking paper. Place all the ingredients in a bowl and mix by hand. It is messy at first but will combine fairly quickly. Once it comes away from the hand knead a bit more and then it is ready to roll out. Flour a large clean surface and roll out the dough until it is about 2-3mm thick. Using a pizza cutter cut long strips in both directions to create rectangles that are about 10cm x 5cm (but really do any size you wish). Now cut the rectangles in a diagonal to create long triangles. Picking up the triangle place the widest end on your finger tips and with a teaspoon take a small amount (less than half the teaspoon) of the spread and place on the wide part of the triangle. Start rolling from the wide end to the pointed end so it looks like a croissant. Place on the baking tray and bake for about 20 minutes or until slightly browned. Allow to cool on a wire rack. For serving sprinkle with icing sugar or roll in caster sugar. These are also ok to freeze prior to sprinkling with sugar. Why a plum spread and not a jam? The reason why it must be a plum spread and not a jam is because of the sugar content. The spread is only about 20% sugar as opposed to the 50% in jam, the spread is less likely to leak out of the rolls whereas a jam will completely melt and pour out whilst baking. I use a plum spread made by “Podravka” that can be found in some grocery stores (such as Franklins) and most delis or fruit shops. If you can’t find it, I have mixed jam with bread crumbs (you could probably also usealmond or walnut meal). It works but isn’t half as nice as the plum spread. If using the jam and bread crumbs I use a 2:1 ratio. Master 8A caught in the act! Taking a jam roll just as I was taking a shot. Forgive the photography please. It'll get better I promise. 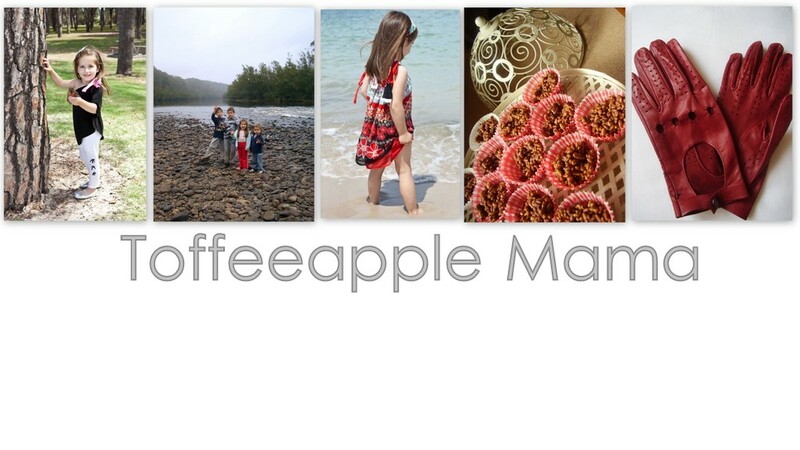 And I am going through a "baking" phase so should soon head back some Toffeeapple Kidswear stuff. I swear. This post has been linked to the wonderful blog "our creative spaces". Pop on over to see what other wonderful bloggers are creating. Goodness me, YUM! Thanks so much for sharing! Wow, those look incredible. What's the difference between jam and spread - is spread runnier or thicker? Spread is definitely thicker. It has less sugar content than jam so when baked it doesn't run. In the jar there is not much difference, its consistency is just a little thicker than jam, it's in the baking that you notice the difference. Quick question, do you melt the butter prior to mixing? Hi, don't melt the butter. Let it soften at room temperature. If like me, you forget, I cube it and zip it in the microwave for a few seconds to soften it up. If it is a similar consistency to the sour cream it will be easier to mix together. Enjoy! Thank you! I have a jar of podravka plum spread and I miss these from my childhood.